Melanie Gillis is a Hamilton based photographer who specializes in portrait, maternity and pregnancy photography, as well as corporate headshots and fine art nudes. 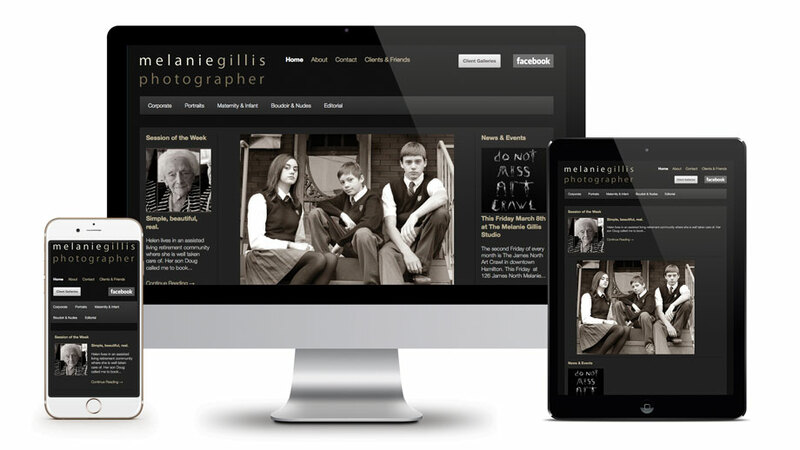 Melanie’s website features a simple and elegant responsive design that is optimized for tablet and mobile devices. I am absolutely thrilled with the work Ryan did for me. I have worked with designers before and found it to be very difficult and time consuming to explain what I want aesthetically and the constant back and forth was always frustrating and took way too long. Ryan looked at my work and the site and materials I had already. With that and a simple conversation about what I would like for my new site, he went to work. I was shocked at how he just understood my aesthetic and structural preferences, and within a week we had a working site I loved! In the next few weeks after that, Ryan was fast and efficient with ironing out any bugs and making small changes or additions. I cannot recommend him enough. Thank you Ryan!